If you thought your style was the best of the best before, think again! This leather business card case isn't just the best of the best, it's the crème de la crème. And once you start talking in British terms, you know you're getting somewhere. Our leather business card cases are worthy of Big Ben, Stonehenge, and the London Eye combined. It's chic vibe will make anyone want to learn more about your business, maybe even take you on a spontaneous trip to London just to keep talking about it. Since promotion is a huge part of any business, having the perfect case for all of your company cards is very important. So instead of just being the cream of the crop, the best of the best or any other idiom that matches this idea – be the crème de la crème. It sounds way cooler, and definitely matches the style of our sleek, unique and bloody terrific cases! 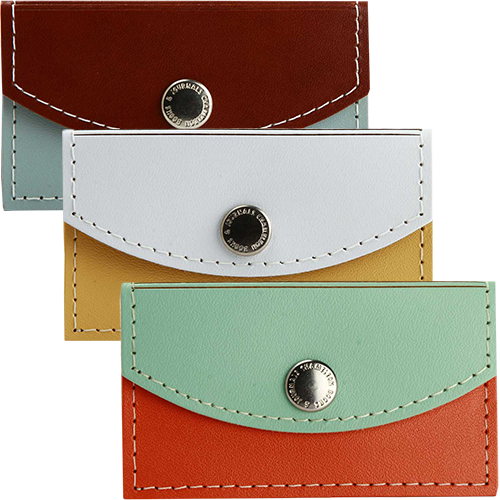 Leather Business Card Cases features eight unforgettable, two-tone styles. Great for storing your business cards, credit cards, photos, and other small personal items. Leather Business Card Cases hold approximately 20 standard size business cards.